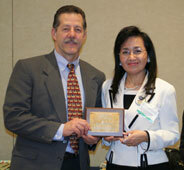 Our Founder visits Leeds University Institute of Psychological Sciences. During a recent visit to the United Kingdom, Our Founder Khun Teeranard was kindly invited to visit The Institute of Psycholigical Sciences department at Leeds University. Dr Louise Dye, Dr Clare Lawton and their team kindly showed Khun Teeranard around their department and discussed current research. Of particular interest was the association between diet and cognitive function. After the tour, Khun Teeranard was hosted to an excellent luncheon including SPA Foods products prepared by Chef Carl and hosted by Maitre d� John. Khun Teeranard recognises the importance of research in this area and believes their work is invaluable for food manufacturers in the creation of a healthy diet. 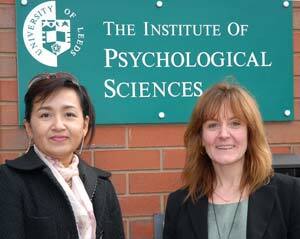 Khun Teeranard pictured with Dr Louise Dye outside the Leeds University Institute of Psychological Sciences department. 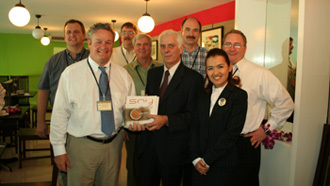 Teeranard Chokwatana and members of the research team. 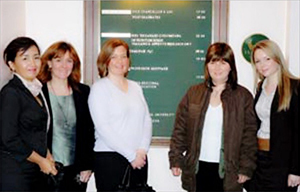 From left to right: Khun Teeranard Dr Louise Dye, Dr Clare Lawton, Ms Fiona Croden and Ms Alexa Brownridge. Copy right by nutritionhouse.co.th 2006 All rights reserved.